Our protagonist, Mahit Dzmare, is a diplomat representing a small non-Teixcalaanli state, Lsel Station. Called to the capital planet unexpectedly, she finds her predecessor murdered, an ugly succession crisis shaping up, and her home at risk of being forcefully assimilated. In the most overtly science fictional thread of the book, Mahit is also neurologically enhanced with an “imago”—a recording of memory, skill, and personality—of the previous ambassador, Yskander. Lsel Station’s use of imago technology to preserve skills, the difference between persistence and integration of personalities, and the way that other characters misapprehend the process is a fascinating bit of the novel, reminiscent of Star Trek’s Trill. Even as she walked further into the strange dim sanctuary of it, she peered upward, trying to understand how the birds didn’t fly up the funnel and escape into the vaulted Teixcalaanli sky...Perhaps succor was enough to keep a whole population trapped, willingly. Succor, and the fine mesh of a net. When she tilted her head to exactly the right angle, she could see it, strung silvery and near-invisible at the funnel’s mouth. The threats that keep the empire’s citizens in line are never too far from the surface—in one of Mahit’s first excursions in the capital, the trains running on time is an ominous reference to Mussolini, and it isn’t long before we encounter the faceless (and possibly AI-controlled) police force who patrol the city. 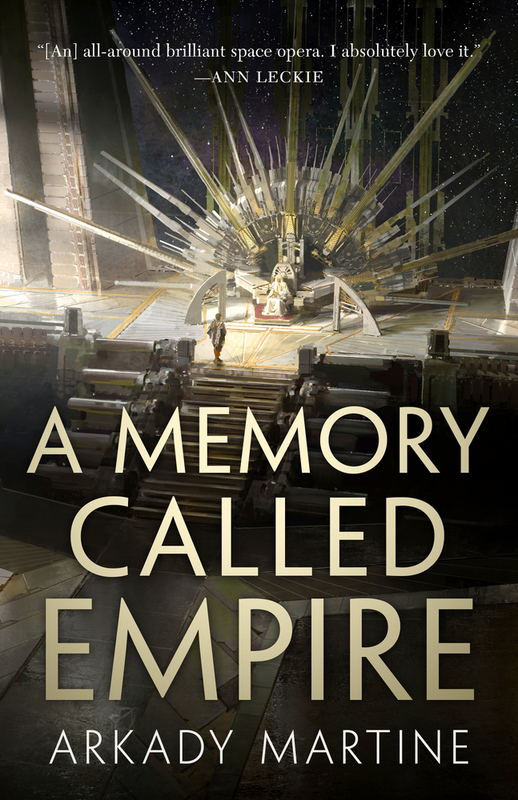 More than the threat of violence, though, it’s the seductive and morally ambivalent sides to the empire that Mahit grapples with, second-guessing things as simple as her pleasure in a poetry competition and as large as the way that her own culture has been warped by its powerful neighbor. Although very different in tone and scope, this struggle with love for a colonizing culture reminded me of Samatar’s A Stranger in Olondria . Mahit is a delightfully but not unbearably competent character—cut off from her expected resources and thrust into an extreme situation, she uses a very believable level of skill to move among the elite. Very much in the vein of C.J. Cherryh’s Foreigner series, the novel follows Mahit as she wrestles with self-doubt and her own status as the alien, with a lot of good narrative action arising simply out of her skill in both following and intentionally bending Teixcalaanli customs. She’s joined by a memorable cast, most notably her cultural liaison and de facto ally Three Seagrass and Twelve Azalea (Teixcalaanli naming conventions are one of the novel’s more enjoyable elements). Three Seagrass and Mahit’s low-level romantic tension is a pleasant subplot in itself, and their genuine attraction foregrounds troubling questions of assimilation, erasure, and exoticizing. When she’s teased for being attracted to foreigners, Three Seagrass rushes to say that she’d like Mahit even if she weren’t a barbarian—a racial and cultural minefield that neither of them can cleanly back out of. Martine keeps the pace snappy, with assassination attempts, surprise revelations, and charged political encounters abounding. It’s a tight plot, despite the pace and scope, and nothing feels incidental or unnecessary: survive, make allies, solve the previous ambassador’s murder, find a way to shift the course of a vast power. In addition to having to figure out a political path forward, Mahit is also attempting to untangle Yskander’s past, while dealing with his sabotaged and supposedly-secret imago. The novel really ups the stakes in the final acts, with the crisis of imperial succession spilling into the streets, and Mahit and her associates embedded deeper than they expected in the unfolding drama. 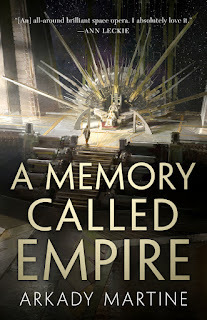 Martine does an unusually good job of both wrapping up the main plot and leaving enough loose threads to allow for rich sequels—the questions of alien invaders, AI deep in the City, and insurgents within the empire all remain open. If I have one critique, it’s that the novel is a little weak in conveying some aspects of the physical world in which it’s playing out. Snippets of news and messages give us a glimpse of the wider empire, as well as Mahit’s home, Lsel Station; but aside from a few architectural flourishes there’s not much sense of what it’s like to be there. The setting often just feels like a succession of rooms, however grand a few of them are. Where it does shine is in smaller cultural details—the connotations of bits of fashion, the way poetry is both high-brow and pop culture, the way that echoes of a more ritualistic past still resonate through the empire. Three Seagrass and Mahit’s collaboration on a bit of poetry to post online—which also contains a coded, time-sensitive message—comes across as one of the more rousing bits of action, which is quite an accomplishment. “Nothing touched by empire stays clean,” Mahit reflects; and while nothing in the novel parallels current events too closely, it also points towards similar crises in our own world—“no ethical consumption under capitalism,” for instance. Like other empire-interrogating works that contemporary genre writers are creating, A Memory Called Empire has no easy solutions for us. The system survives, even if a few villains are taken down. Still, this is a compelling, delightful novel—and it places these issues at its heart, and gets us to take them as seriously as any of its fictional problems. Mahit has kept an important part of herself clean of the empire, I think, and it’ll be very interesting to see what happens next.